These pages contain details of all twelve Qango UK shows. 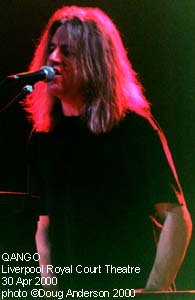 John Young (keyboards & harmony vocals). 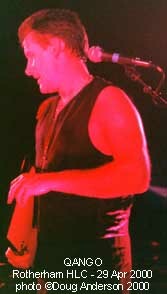 John Wetton began recording with Mogul Thrash, moving through, Family, King Crimson, Roxy Music, Uriah Heep, UK and onto worldwide stardom in Asia. He has since begun a solo career. Dave Kilminster and John Young have both played in the John Wetton band, Dave Kilminster for the last 3 years, John Young at around the time of Wetton's Arkangel album (he co-wrote half the album with Wetton as well as one track on the previous Wetton release, Battle Lines). Since then JY has written a solo CD (Life Underground) and tours as a solo performer. Liscombe Park and Bridgend still require a full review (I exhausted my imagination for ways to differ the way I describe the shows at the time) and I must dig the notes out and finish them. I still have more photos to scan and add to the pagesthe first batch of which are being used in this first update of 2002. I should point out that the logo I've used on these pages is the one used on the CD sleeve. The one used on the T-shirts is just plain text and pretty boring (in my opinion - and judging by the minimal number of sales at shows my opinion was shared by the vast majority of punters!). "The House of Blues (an American chain of venues owned by Dan Akroyd) want us to play but there's not enough dates to make it viable. We're waiting to confirm other shows." 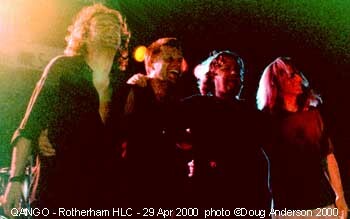 As of May 2000 the future of the band was still uncertain, the American dates looking unlikely at the moment though a couple of Italian dates are pencilled in over the summer. No record deal has been signed as yet. Hope remains high though. 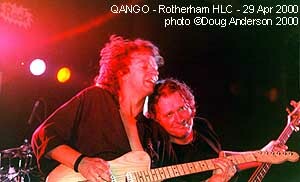 The official news on QANGO and John Wetton's solo projects can be found at CHASING THE DRAGON. What was the official ASIA reunion pages (and linked to Carl Palmer's ELP site) have some details on QANGO and some pictures taken by yours truly on them now. March 2001: Well, hope is all we had. John Wetton returned to solo work, Carl Palmer is now doing drum clinics and promises a three piece band doing ELP covers (not very original really) but with a guitarist instead of keyboards. He also has an anthology CD due for release over the next couple of months. For the forseeable future (if ever) it looks as if further Qango activity is unlikley. This page is Copyright © Doug Anderson 2000 - 2001. Created: 9 February 2000. Last updated: 17 January, 2002.